Richard, the first Cab Franc I ever tasted was from the Nelson Estate in Sonoma and I did not like it because of the green bean, vegetal taste.Then the Tinhorn Creek Estate winery up in the Okanagan Valley in British Columbia started to produce it. Sandra Oldfield, the winemaker does an outstanding job with this grape and produces an excellent Cab Franc. No more vegetal, green tastes. Just beautiful black fruit flavors. I believe it is the climate up in the southern Okanagan that makes the difference. Hot July and August days along with cool nights easing into a cooler fall allowing the grapes to reach maturity at a slower pace.It can truly make remarkably tasty wines and of course DNA testing has shown Cab Franc to actually be one of the parents of Cabernet Sauvignon.Hope you get a chance to try a Cab Franc from BC. The problem I find with most hot-weather cab franc is that winemakers try to turn it into cab sauv with over-extraction and way too much barrel time. I'm a Chinon lover...and also love some of the cab franc here on long island. 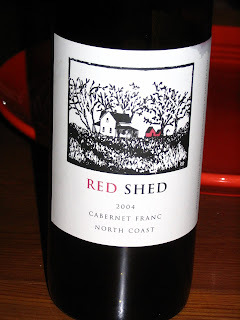 I don't think I've ever had a warm-region cab franc that I liked at all. From what I hear from vineyard managers in this part, the key to avoiding overbearing vegetal flavors is to make sure that the grapes get good sun. Which means a lot of de-leafing in the vineyard. Debs, we should get you the Saumur Champigny that we have as well as the Chinon. They're delicate but are V8s compared to the bold and ripe Napa fruit evident in the Red Shed. What Cab Franc are you going to try next? I side with Lenn are recommend a Chinon or maybe a Bourgueil. I think they show best with food and either need to have some age or at least be decanted. I'll have to try that Okanogan Valley one too--I grew up there!! I agree with Lenn & Jeff. Cool climate Cab Franc is far differnt from the CA versions. Dr Debs, you should try a 2002 Breton Chinon "Les Picasses" before it disappears (even though it cost around $30). Thanks Wilf as that sounds more like a Cab Franc that I might like. Sorry for the silence, folks! Yes, Jill, I DID like this wine. I like Cabernet Franc a lot and actually the only cab franc I wasn't particularly fond of was French because it was very, very vegetal (canned green beans). I know the North Coast AVA is huge, but if this fruit came exclusively from Napa it would have said so, so I'm guessing it had a mix of warm and cooler weather cab franc. What I was trying to comment on here, though, was really the fact that drinking a varietal you don't drink often can help make you more sensitive to all the things you do drink more often. I was in no means implying that you mustn't have liked the wine. Just my $0.02 on others you could try and that I'd be curious to know what you thought about. Jeff--no worries. I definitely want to try a Chinon. I've had a Saumur-Champigny and not thought that much of it, but am open to (almost) anything, as you know! I am a big fan of Cabernet Franc for exactly the reasons you state. I love Chinon and Saumer Champigny. Washington state does a great job with it as does Long Island. I find the California Cab Francs to be hit or miss but Lang & Reed can do a pretty decent job depending on the vintage.